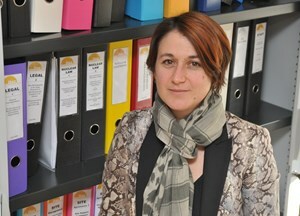 Laetitia Grammatico, ITER's Legal Advisor since 3 January 2012. The photo is dark, but if you look closely you can see Laetitia Grammatico, ITER's new Legal Advisor, at the November 2009 signature of the Site Support Agreement between the ITER Organization, CEA and Agence ITER France. She was also present at the signature of the Headquarters Agreement between ITER and France in November 2007 but you'll have to take our word for it—she's not in the photo. Although Laetitia has only just joined ITER, she has accompanied the ITER Project—in one capacity or another—since the establishment of the ITER Organization. As the Head Legal Advisor to Agence Iter France from September 2007-December 2011, and as Technical Advisor to the High Representative for ITER in France (HRFI) from January 2010-December 2011, she became well acquainted with the very particular legal status of the ITER Organization—an international organization and a nuclear operator in France. "The legal structure chosen to conduct the ITER Project, an international organization enjoying privileges and immunities, is unique on French territory for the operation of a basic nuclear installation," says Laetitia. "Many novel issues have arisen since the signature of the ITER Agreement that have been addressed, one by one." In her advisory role to the HRFI, she travelled several times a week to Paris to follow through on all matters relating to the implementation of the ITER Project in France. Back at Agence Iter France, she focused on the issues related to the preparation of the ITER site such as permits, impact studies and consultation with French administrative authorities. "This double background is extremely useful to me as I take on the responsibilities of my new post," says Laetitia. The legal issues relating to the setting up of an international organization as a nuclear operator are now largely resolved; ahead are issues relating to how this status applies in practice. "How, for example, will ITER Organization manage—and protect—the intellectual property that this project generates? We are only at the beginning of establishing a process for this," she stresses. Other areas that will require her attention: issues related to the construction of the nuclear installation; privileges and immunities of the ITER Organization and its staff; and the preparation of all formal legal documents implementing the ITER Agreements in the context of international cooperation. "It's very interesting to pass from a national public agency to an international organization," comments Laetitia. It's also a privilege to be involved with a young organization like ITER and to work in an international environment—with its specificity in terms of regulations because as a young Organization had to set up its legal framework from scratch." Laetitia feels particularly at home with questions of energy and environment. She did her thesis on energy law (Université de Montpellier, 2003); following her PhD she joined the legal department of the CEA in Paris where she spent four years. "I came across questions of energy and the environment early on during my studies and found the legal issues surrounding these subjects absolutely fascinating ... especially the area of nuclear law, which I made my area of expertise." She was asked to create the curriculum of a new Master's program in energy law which was created in 2010 with the Faculty of Law of Aix-en-Provence and the INSTN/CEA, for which she also gives training. Mother of two, Laetitia is also passionate about the evolution of professional women in today's society, and how to balance personal and professional spheres. She was awarded the 2011 Fem'Energia prize, which recognizes the accomplishments of woman in the nuclear sector in France, and hopes that her example can inspire other women.